Nova Roma has a Sodalitas Militarium which is devoted to the study of making war, as well as cataloging, modeling and re-enacting the great Military Forces that were Rome's. 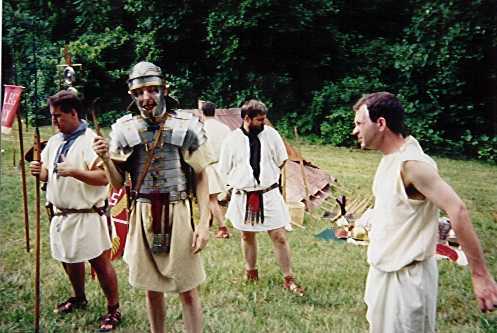 Thus, Nova Roma gains citizens and exposure, and the reenactors gain exposure and support. We don't lose anything by including them, and the only increased obligation they have is to have a stack of our flyers at their events. Units wishing to be sponsored by Nova Roma, or that have more questions regarding the program, are encouraged to email the Consuls. 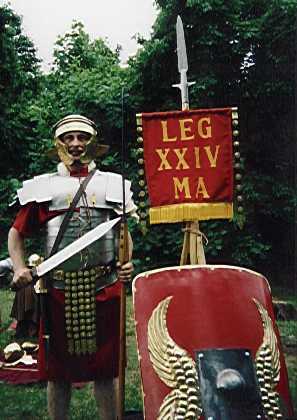 Legio XXIV Medius Atlantia is based in Newtown Square, Pennsylvania. It is a 1st-Century Imperial era reenactment unit, and is commanded by Gallio Velius Marsallas, a Citizen and Tribune Militaris of Nova Roma. The Legio is currently seeking members. 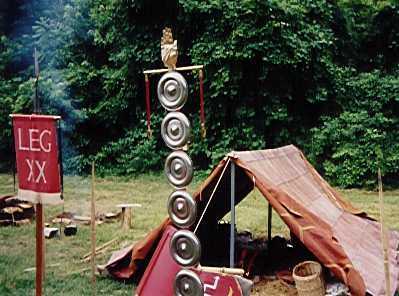 They were in attendance at Roman Days in Maryland, as well as several other events in the last few months. They will be attending the Fort Malden Military TimeLine event in Amherstburg, Ontario, Canada on August 5th-6th, 2000.; Check out their Website at http://www.legionxxiv.org It is loaded with links to other Roman Legions, Suppliers and contacts, along with many Historical Roman Organizations and data. The "Links" pages, "Roman Names" page, "Glossary" and "TimeLines" are quite comprehensive, along with a "Photo Gallery thru Time." Take a look. Legio V Alaudae (The Larks), based at Ft. Bragg, North Carolina, is a reenactment unit from the time of Caesar through the 1st Century AD. Its commander is Centurio Primus Pilus Gaius Atilius Lepidus, a Citizen of Nova Roma. The legion was founded in September of 1999. 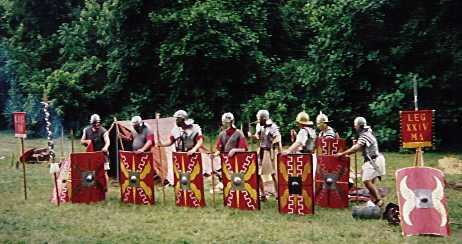 Sponsorship of Legio V Alaudae was granted by the Senate of Nova Roma on 5 December 2000 by Senatus Consultum. Legio V's website is http://community.webtv.net/paulfitsik/LegioVAlaudae.